Just a quick update post with new photos of the garden that's doing remarkably well this year! 1. "Summer In February" by about an Edwardian artists' colony in Cornwall soon to be a movie too. 3. "The Kingdom of Men" by Kim Barnes- in the midst of reading, very intresting. have a wonderful week and 4th!! I am happy to announce that a few new products I've been working are listed in the shop today under a new section called GIFTS, I've been working on these for a while now, if you follow me on Facebook or Instagram you've seen some sneak peeks. The tiny little Pill/Tooth Fairy Box is vintage and I only have 4 of these! I am really excited about the Bookmarks! 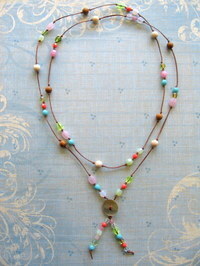 they make wonderful practical gifts, I even have a Set of 3! for those who read a few books at once, do you do that? I always have a few books on my night table! I got my copy of Decorate yesterday and what a treat!! The book was written by Holly Becker from Decor8 blog and Joanna Copestick with amazing photos by Debbie Treloar. Pure inspiration on every page! Here is a little glimpse of what you will find inside and thank you again Holly for letting me use some images from the book for this post. It's been nice and quiet around here this past week, Ronen is away filming a documentary for Frontline(PBS) I'm not sure when it will be aired but I promise to let you know. 1. I re-read The Pursuit of Love and Love in a Cold Climate I love these books, the first time I read them I was in my 20's...it was a very different experience to read them now. 2. The Old Man and Me, great read! 3. The Flying Troutmans, I'm reading it now and enjoying it a lot. 4. The Three Weissmanns of Westport I took this one out of the Library, I try not to buy hard cover books anymore, it's a great read too. At first I was a little reluctant to watch yet another documentary about "going green" but there is something about this documentary that really makes you think, it's a story about one little family living in NYC that is making a difference, I personally totally identify with the wife and it's interesting to see how she too changes throughout the film and what she eventually "takes" from the experience ...I highly recommend watching it! you can also watch it for free if you have Netflix . I can't wait to put my hands on it, I'm sure it will be great! 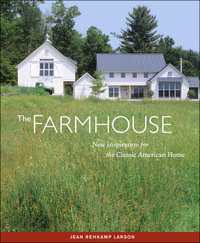 The farmhouse - by Jean Rehkamp Larson, a beautiful book about the classic American icon in many versions from funky to classic, and my dream house is in there too. 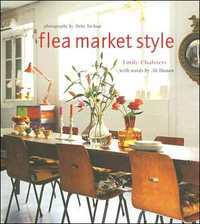 Flea market style- by Emily Chalmers, this book is amazing it really made my mouth water, it's just my style! 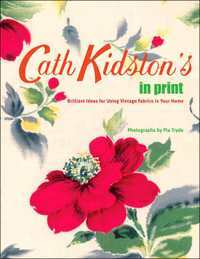 Cath Kidston's in print, prettiest book ever,great ideas for using vintage fabrics. 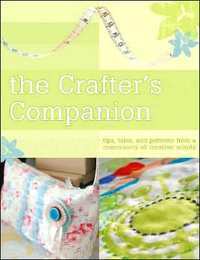 The Crafter's Companion, some of my favorite crafters and blogs are in this book. 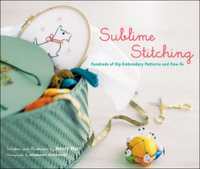 Sublime stitching, great embroidery transfers for great easy projects. 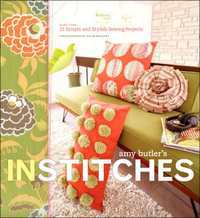 Amy Butler's in stitches, A Wonderful idea book full of inspirational photos and projects. So instead of working, I roam around book stores and have lattes, but it's so sunny, it's spring and what is more beautiful then a sunny spring day in Burlington Vermont? Oh well ,definitely my idea of a fun day! I just wish my sister was here! I bet you think I just got an amazing book to read!!! Ha! no! I got a great SEWING book, didn't think I would ever actually buy one of those but this one is great i couldn't help myself, I already made a few things just to try it out and it all worked!! on top of everything it's very very pretty. So here I am slowly becoming more domesticated every day...amazing. I can't believe I used to be a big shot fashion editor once, very strange. Anyway this book is called "Simple sewing with a French twist", it's great. I am working a lot getting ready for the Queencity Craft Bazaar I keep wanting to cancel because I don't have enough stuff, but I won't. Next week I have 3 new Interior Decorating clients, very exciting, I love to work so much!!! I feel so alive when I am working, of course I feel alive when I am cooking too , I guess it has to do with my ego, some one wants me, someone needs me...I love it. Ronen is coming back tonight, I can't wait to see him, it's been 2 weeks!! A cinematographer's life...I should stop complaining it's actually good to get a break once in a while, but 2 days is enough for me.